« GPS vs. Avocet 35: Which is more accurate? Bald Peaks Trail from the summit, looking southeast. Today I toured the Rancho Cañada del Oro Open Space Preserve by bike, and it reminded me that the mountain bike can take me to interesting places I would never go on a road bike. As parks go, Rancho Cañada del Oro isn’t all that old, opening in 2004. Still, it took me long enough to discover it. Since 1993 I’ve been paying taxes toward the Santa Clara Valley Open Space Authority, but I’ve never had the occasion to visit a preserve. I’ve read the occasional story about the authority buying up land somewhere south of San Jose, but that’s the extent of my awareness. I’ve always been a Midpen user, even though I’ve never paid taxes toward that open space authority. I’m not much of a mountain biker, not counting the hundred of miles of dirt roads and trails I’ve covered on my road bike. My biggest complaint is the gnarly climbs and descents most mountain bikers prefer. My two favorite mountain bike rides are easy stuff for most riders. Rancho Cañada now ranks as my second favorite ride after Almaden Quicksilver. One of my least favorite routes is the nearby Santa Teresa County Park. I’d wager more than half of the trails are “rocky.” Rocky Ridge Trail says it all. 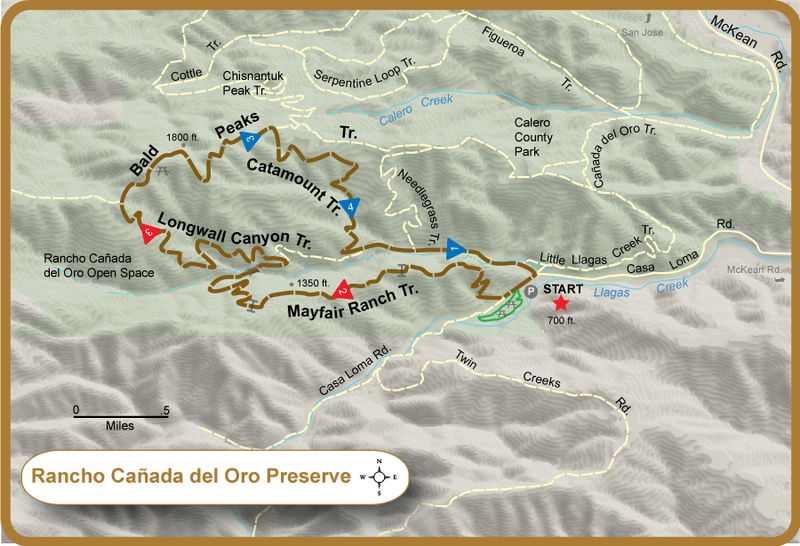 The preferred route is a clockwise loop that starts at the parking lot and goes west on Mayfair Ranch Trail, left at Longwall Canyon Trail, up Bald Peaks Trail to the summit, then all downhill on Catamount Trail. It’s eight miles, and about 1,800 feet of climbing. Ride time is about two hours. Mayfair Ranch Trail starts out steep with several short switchbacks. All but the strongest riders will have to walk some sections, especially if you’re a senior citizen like me. This is decidedly single-track riding on a man-made trail. It goes on for about five miles. After about 1.7 miles of climbing and some level riding, there’s a brief downhill to Llagas Creek. It’s not technical and not all that steep. 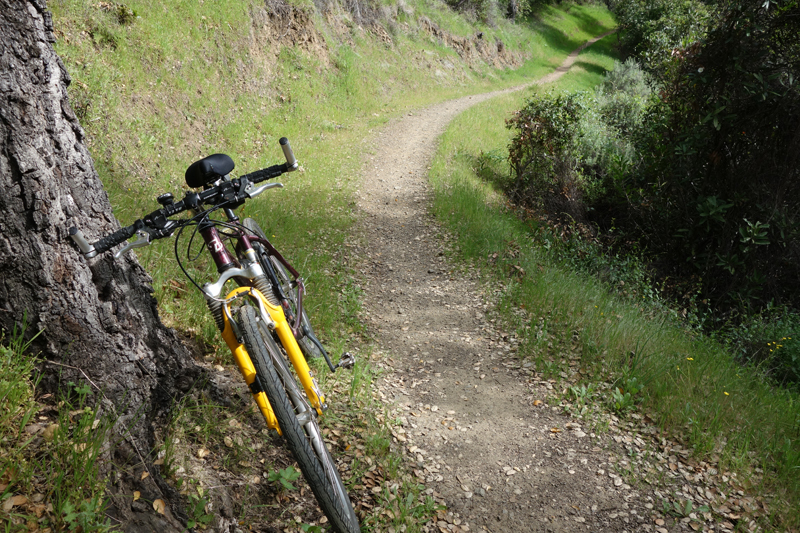 The ride up Longwall Canyon Trail will test your gears and your fitness. If I were young and strong, I could probably ride all of it. The views of the valleys are spectacular, and you’ve got Mt. Umunhum looking down on you. Some nice single-track on Longwall Canyon Trail just before Bald Peaks. Bald Peaks Trail follows an old ranch road. At the water trough, catch your breath. There’s a short, steep climb that I don’t think I could have ever ridden up in my youth. It’s about 25 percent. But then the climbing is over and it’s all flat or downhill. You’re on top of the world here with a 360 degree view of the valleys and mountains. Well worth the effort. The road is overgrown with short grass, but there’s no difficulty finding your way. It’s obvious. All junctions are well-signed. Take a right down Catamount Trail and enjoy the steep stuff. One short section is 25 percent, and a tad more. Control your speed and all but the most conservative riders will have no difficulties. At the junction with Longwall Canyon Trail, I met up with some rangers spraying milkweed thistle. The stuff has medicinal value, so I’m told, but it’s no friend of the outdoors. At the end of the descent, there’s one more creek crossing, the deepest of several. I walked it. All in all, it was a ride worth the trip by car. The route has something for everyone, single-track, beautiful views, a few stiff climbs and descents to get your blood circulating, but nothing daunting. Best done on a weekday in the spring. I’ve also hiked here. My favorite trail is Little Llagas Creek. It goes through an abandoned orchard and uphill on a single-track. The route I took is the only one available for bikes. Note that some of the ride goes through Calero County Park. Note: I measured the route using a Cateye wireless cyclometer and a Garmin 500. The Garmin was 0.7 miles short, but maybe that’s because I carried it in my back jersey pocket. I’ll check. I rollout-calibrated the Cateye, and based on the park map mileages, it’s accurate. Follow-up: The Garmin 500 works fine in the pocket, after I tested it, so the issue with Garmin is that it doesn’t do a good job measuring on trails. That’s all I can think of right now. Rancho Canada de Oro borders Calero County Park to the south. This entry was posted on April 4, 2018 at 10:14 pm and is filed under Ride reports. You can follow any responses to this entry through the RSS 2.0 feed. You can leave a response, or trackback from your own site. Thanks for sharing. I’ve recently learned about this place from the OSA. Do you think this is doable on a cyclocross/gravel bike? Not recommended. Catamount is gnarly steep for a stretch. However, I’m told Chisnantuck Peak Trail, just opened for bikes and man-made, has a nice grade. It connects with the open space and Calero County Park. Almaden Quicksilver’s Mine Hill Road and Randol Trail is a yes for road bikes. A nice 10-mile loop. At my age, I lean toward the mountain bike for trails.